Self-blinking cool (natural) white LED bulb with metal bayonet (twist-in) base. Replaces #455 incandescant bulbs. 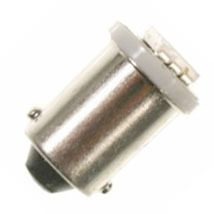 Can also be used in place of any non-blinking 6-volt bayonet base bulb such as #44, #47, #55, or #51. BLINK RATE: These LEDs blink once about every 2 seconds. They are on for about 1/4-second, then off until the next blink.